Although public transport between Paris’ Charles de Gaulle Airport and the city is adequate, with journey times of 30-40 minutes on the suburban RER rail line that operates directly from the airport, it does not compare well with, say, the forthcoming (2019) Elizabeth line or the Heathrow Express in London, which offers a journey time of only 15 minutes. With the 2024 Olympic Games in Paris on the horizon, a decision was taken several years ago in favour of the ‘CDG Express’, to have a journey time of around 20 minutes over a distance of 32 km. Now a consortium has been selected to operate it. There are numerous political overtones to this deal, from the selection of an entirely French partnership to the fact that it has been given the green light, not by the Transport Ministry but by the Environmental one. An all-French consortium has been selected to operate the CDG Express: 'Hello Paris'. Hello Paris was selected in lieu of a rival bid led by Transdev, another French-based international public-private transport operator. The service will open before the 2024 Olympic Games. The decision was made by the Environment Minister. Emmanuel Macron’s presidency has given the environment ministry renewed powers, which include: climate change, biodiversity and management of natural resources, as well as energy and transport. France’s Minister of Ecology, François de Rugy, has selected a consortium, ‘Hello Paris’ for the concession to operate the future ‘CDG Express’ Paris Charles de Gaulle – Gare de l’Est rail link – comprising the French company Keolis and transport operator RATP Dev. The connection is scheduled to enter into service on 01-Jan-2024, before the 2024 Paris Olympic Games. The contract includes a five-year operational preparation term (2019-2023) and a fifteen-year operations term (2024-2038). The consortium will operate the French multinational company Alstom's Coradia Liner train sets, providing a connection between the airport and Paris in 20 minutes along a distance of 32km. Eight km of the track will be new and the cost will be EUR1.7 billion. Project finance is from a consortium of SNCF Réseau, Groupe ADP and the French public sector financial institution Caisse des Dépôts. Previously, the government had intended to impose an additional airfare tax to pay for it. That proposal went down badly (like heads at the Place de la Concorde in 1793). The first peculiarity of this announcement is that it comes from the Environment Ministry rather than a ‘Ministry of Transport’. When M. de Rugy became head of the powerful Environment Ministry on 04-Sep-2018 he replaced Nicolas Hulot, an environmental-activist-turned-minister who had resigned his post dramatically during a live radio interview in a row over “the slow pace of climate change legislation”. M. De Rugy is also an environmental activist whose political career was reactivated by the election of President Macron, to whose mast he nailed his colours. Macron’s presidency has given the environment ministry renewed power. Its broad remit includes climate change, biodiversity and management of natural resources of course, but also energy and transport. Formally called the ministry of ‘ecological transition’, it is charged with preparing the country’s shift to a low-carbon economy. The environment minister is also one of just two ‘ministers of state’, which by protocol makes the position the third most important after the prime minister and the interior minister. One might reasonably assume that clapped-out diesel trains will not be running on the ‘CDG Express’ line. The other peculiarity is that it is an all-French affair. According to the CAPA Global Airport Investors Database, Keolis is the largest French private sector transport group, mainly active in road, rail and tram transport but with some retained management interests in four small French airports. RATP Dev operates and maintains urban and intercity transportation systems on four continents, but is best known for operating the Paris Metro since 1900 and (on a shared basis with the state rail operator SNCF) the commuter rapid transport RER lines around Paris that interface with the Metro. 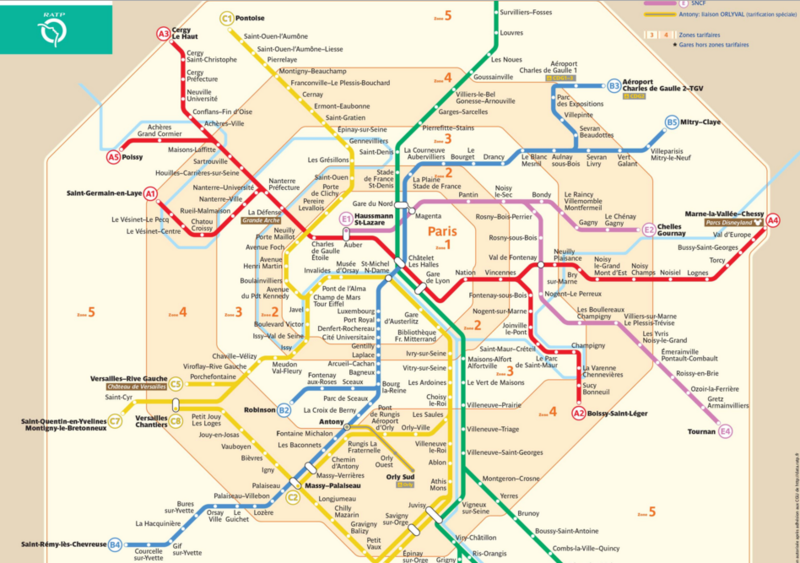 One of the key RER lines (B) runs from CDG to two central Paris stations – Gare du Nord and the huge Châtelet-Les Halles, one of the largest underground stations in the world, where three RER and four metro lines interconnect. That is the main public transport link. Some services are nonstop to and from Gare du Nord; others stop at all stations. Maximum journey time: 30 minutes (Express) and 40 minutes (Stopper). It is also possible to travel from CDG to central Paris on the high-speed international TGV rail service, but frequencies are fewer and prices higher. But is this actually a ‘peculiarity’? French financing and engineering companies often co-operate uniquely, in the international domain, and on airport projects. And on the one occasion when ‘outsiders’ were overtly allowed in – the partial privatisation of Toulouse Blagnac Airport in 2014, which involved two Chinese firms, Friedmann Pacific and Shandong Hi-Speed Group (now known as CASIL Europe) – it was heavily criticised. This month, France's Administrative Tribunal again criticised that deal in a report commissioned by the French parliamentary finance commission, arguing that the purchaser lacked both “experience in terms of airport management” and “financial transparency”. There is certainly no lack of experience in the Hello Paris consortium. N.B. 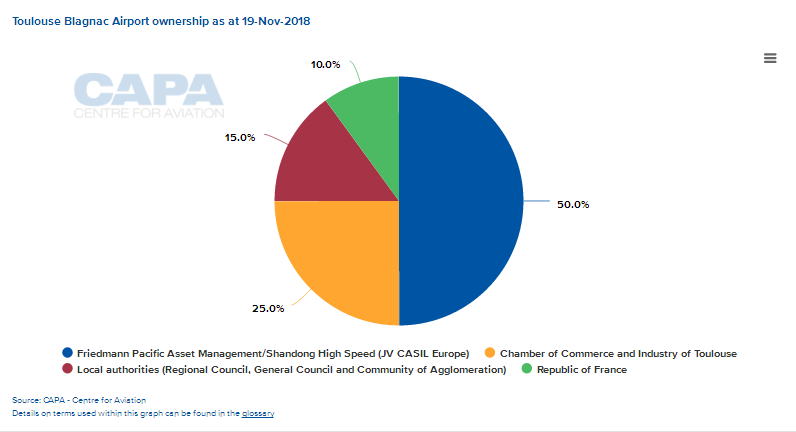 In Feb-2018 the French Government renounced plans to divest 10.01% of its capital share of Toulouse Blagnac Airport to Casil Europe, arguing that it is not in the public interest to do so. The Government held a sale option for its 10.01% stake up to Apr-2018. (The CASIL Europe consortium, comprising Shandong Hi-Speed Group and Friedmann Pacific Asset Management, continues to hold a 49.99% stake in the airport). Hello Paris was in fact selected in lieu of a rival bid led by Transdev, previously Veolia Transdev, another French-based international public-private transport operator. Transdev lodged a legal challenge against the Hello Paris bid in early Nov-2018, noting that both Keolis and RATP Dev were subsidiaries of state-owned monopolies, and suggesting that it would further hinder the opening of the French rail network to competition.